Naturalists and historians in Victoria have always had a strong interest in John La Gerche, the forest bailiff credited with starting the restoration of the forest between Ballarat and Creswick, after it had been largely denuded in the Gold Rush of the 1850s to 1880s. While many other bailiffs and foresters played a part in 130 years of forest management, La Gerche’s detailed diaries and work books have made him a legend in the history of land care and revegetation in the state. In 1998 a 2.2 km walking trail was established near Creswick to commemorate La Gerche’s life, his example in Landcare and the establishment of Creswick as a Centre for forestry training. 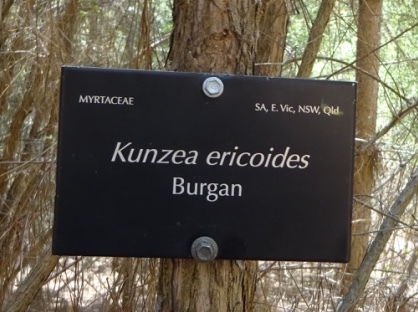 In 2014-16 the Field Naturalists Club of Ballarat took on a project to ‘enhance the interpretation and signage’ on the La Gerche trail, so as ‘to improve information available’ to the public and school groups, on the history of mining and forest conservation in Victoria. Work started with mapping and the listing the mixture of native species and towering exotic trees in this historic plantation. A grant was procured for signage to update and replace many old signs on the Trail that had become faded since 1998. This involved working closely with community groups, with Parks Victoria staff who manage the Sawpit Gully site. Workshops were held by club members to plan the logic of the information on signs on the Trail, with involvement of experts in forestry, biology and history. – Members of Field Naturalist Club of Ballarat and Creswick community have strengthened interest in the La Gerche Trail and its future. – New signs include updated information on history and also on biology, flora and fauna associated with the area. – Improved signage enables public, schools, tourists to understand and enjoy the landscape, and historical and botanical features of Creswick-Ballarat and the whole Goldfields region. – New map of Trail enables public to select and locate routes appropriate to their access and other needs. -The new maps and signs have improved the ease and benefits of use of the La Gerche Trail, and make the site attractive to a wider range of the public, educational groups and local, national and international tourism enterprises. – The website information (and QR Cod linkage) improves access to information through social media on the La Gerche and the Creswick area. Many people assisted with this project, and our gratitude is due to all members of the Field Naturalists Club of Ballarat who helped. Parks Victoria staff took a major part especially Kyra Wynduss, and Interpretation Officer David Newton who coordinated the signage contributions from Field Naturalists Club and community groups including Business and Tourism Creswick, and the work of graphic artist Liz Skrokov of Cressaid Logic. The contribution of specialists to the project was valuable, including forest scientist Professor Kevin Tolhurst and Rosemary Tolhurst, Parks Victoria Thanks also to Gerry Fahey, Librarian at University of Melbourne’s Creswick Campus, and to Margaret Fullwood of Creswick Historical Society and DSE historian Daniel Catrice. The major part of the funding for this project was provided through a Local Landscape Enhancement Grant from the Victorian Department of Environment, Land, Water and Planning.